The Millennium Mayfair is a 5 star luxury hotel with traditional British hospitality which was once the home duchess of Kendal. Features no less than two restaurants and two bars. The building started life as a mansion in the 1700's when it was in use as a residential stately home for the Duchess of Kendal and it still retains its original Georgian facade. The hotel is the spot where Wellington's victory over Nelson was announced. Here you will friendly service but where your privacy is respected. The decor is stylish and elegant and combines with the relaxed and intimate feel. Bedrooms: Standard bedrooms have a traditional English style with rich wood furnishings, high ceilings and soft tones for a relaxing feel. In-room facilities include Air Conditioning, Bathrobe, Cable TV with pay movies, Coffee/Tea maker, Desk, Hair Dryer, In-room Safe, Individual Climate Control, Iron/Ironing Board, Mini Bar, Modem/Data Port Connection, high speed internet access, international power sockets and Telephone with voicemail. Standard bedrooms are 26 sq metres (280 sq ft) and mostly have views out over Grosvenor Square and its central garden. Superior Plus rooms are 36.5 sq metres (387 sq ft) and decorated in a traditional and elegantly English style. They have a super king size bed with a marble bathroom. Largely overlooking Grosvenor Square and gardens. Club rooms are 42 sq metres (452 sq ft) and give access to the executive lounge on the seventh floor. The club rooms also have free WiFi. Suites also have access to the executive lounge. Room service is provided 24 hours daily and a full maid service operates at this hotel. Evening turndown service. The Executive lounge offers a complimentary continental breakfast along with pastries and drinks all day long. You will find newspapers here and in the evening canapé and champagne are served. Complimentary breakfast served. The lounge has a wireless internet service and interview rooms. Open 07.00 till 21.00. The Avista Restaurant and Bar: Located adjacent to the Millennium Mayfair hotel and has a separate entrance. 75 seat capacity (another 25 seats in the bar). The restaurant was designed by David d'Almada. Featuring a long wooden Chef's table suitable for larger parties up to 12 people. The restaurant has a granite-topped work station where chefs make the finishing touches to their creations. Serving a wide ranging menu bringing together rustic and modern Italian dishes. The wine list features fine wines mainly from Italy. Also serves executive lunches and daily specials. The bar has a trendy feel and is decorated with Large abstract paintings. Selective seating at the bar and subdued lighting maintain a cool ambience. Open: 12.30 till 14.30, 17.30 till 22.30. (Saturday dinner only, closed Sunday). Bar is open noon till midnight (Saturday 18.00 till midnight, closed Sunday). Pine Bar: Cocktail bar. Elegant, sophisticated and intimate style. Features pub style stools, luxurious leather banquettes and armchairs along with oak panelling on the walls. Black chandeliers light the tables below. The Pine bar is noted for its cocktails. Live piano music and serves light snacks/meals along with afternoon tea. Shogun: Authentic Japanese cuisine. Open daily except Mondays. The restaurants is held in high regard for its broad ranging menu. Enjoy dishes from from grilled teriyaki to hand-rolled sushi. Open: 18.00 till 23.00 (closed on Mondays). The Millennium Mayfair hotel has a 24 hour business centre onsite where facilities includes high speed internet access, secretarial services, photocopying, faxing, courier and printing. There are three booths available in the Business Centre for guests where they can plug in faxes and computers. The centre is open 24/7. There are also 10 meeting/conference rooms able to handle anything from 1 to 700 delegates cocktail style. All public areas of the hotel have a WiFi internet connection. The hotel has a wedding licence and can perform ceremonies. Additional services include 24/7 reception and concierge, currency exchange and laundry/dry cleaning pickup. The hotel has a fitness suite with the latest in cardio and resistance equipment (rowers, cycles, Stairmaster) as well as free weights. Open: 05.00 till 22.00 daily. An added convenience is the London taxi rank right outside the hotel entrance. Features the innovative Ask Alfred concierge service aimed solely at giving kids their very own concierge. Nearest: Tube Station: Bond Street 0.3 miles (0.5 km), Railway Station: London Marylebone 1 miles (1.6 km), DLR Station: Tower Gateway 3.3 miles (5.4 km), Motorway: M1 Junction 1 5.4 miles (8.7 km). Opposite the American Embassy in the centre of the exclusive Mayfair area is the Millennium Hotel Mayfair London. The hotel is on the South side of Grosvenor Square overlooking the open space in the middle of the Square that forms something of an tranquil island from the road that surrounds it. The main entrance to the hotel however is behind the hotel in Adams Row. Less than 400 yards to the West, just across Park Lane, is Hyde Park which itself is adjacent to Kensington Park Gardens. The park has a long history having seen many historic events in its past including hangings and riots. Today it provides a great place for all the family with no end of things to do and see including horse riding (from nearby stables) and boating on serpentine lake when weather permits. Its also often used for open air concerts. High quality and upmarket shopping is all around the hotel. Oxford Street to the North is the most densely populated street in terms of shop square footage in Europe and is very much geared to the tourist. To the east is the fashion and jewellery of Bond Street while just beyond Bond Street is Regent Street with a broader mix of shops, boutiques and restaurants. To the South of the Millennium Mayfair Hotel is Piccadilly home to famous names such as Fortnum and Mason where many of the rich and famous prefer to shop. Perhaps testimony to the exclusivity of the area is the fact that Mayfair is the most expensive street on the English version of the monopoly board. The location is also very much part of central London and affords easy access to all the major tourist areas. Local attractions include Speakers Corner (0.3 miles), Marble Arch (0.4 miles), Wallace Collection (0.4 miles), Piccadilly Circus (0.7 miles), Buckingham Palace (0.8 miles), Madame Tussauds (0.8 miles) and Harrods Department Store (1 mile). Public parking is available in close proximity to the hotel and costs £42 per day. WiFi can be picked up throughout. Fee is £10 per 24 hours. Millennium Knightsbridge Hotel: is 0.9 miles (1.4 km) away, has a guest satisfaction score of 77% and rates start from about £176. Bailey's Hotel London: is 1.8 miles (2.9 km) from here, earns a customer rating of 87% and base rates begin at about £161. Millennium Gloucester Hotel: 1.8 miles (2.9 km), rated at 78% and with rates from around £97. Millennium Copthorne Hotel At Chelsea Fc: 2.6 miles (4.3 km), rated at 80% and with rates from around £95. Compared to other London hotels: This hotel has been rated 78% by past guests. The London average is 80% and the average for 4 star hotels is 83%. Therefore this hotel is below average for its sector (star rating) . Millennium Hotels across the chain average 79% so this hotel is slightly below the guest rating for most Millennium hotels. Milesfaster ranking: 498th from 866 London hotels, 3rd of 5 Millennium Hotels, and 233rd of 328 four star rated hotels. Another to Consider: Another hotel that is much like the Millennium Hotel Mayfair and not too far away (0 miles, 0.0 km) would be the 4 star Doubletree By Hilton Tower Of London, where prices begin from around £119 and which has an 89% guest satisfaction rating. The Doubletree By Hilton Tower Of London also offers: free WiFi. If you are looking for something a bit cheaper then take a look at the Chamberlain Hotel. 0.1 miles from here (0.2 km), has been rated at 91% by past guests and has rates from around £87 (theres free WiFi too). 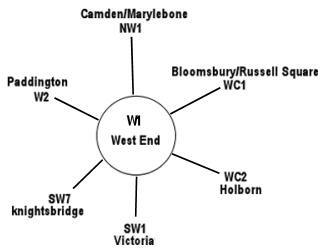 The fifty hotels that are closest to this location (44 Grosvenor Square, SW1 postcode) which we list extend for a 0.6 miles (0.9 km) radius. Consisting of 27 five star hotels (average rating 88%), 21 four star hotels (average rating 80%), 1 three star hotel (rated 59%) and 1 two star hotel (rated 70%). Top 4 star hotel is Chesterfield Mayfair Hotel at 98%. Of the 50 local hotels top rated are The Beaumont London (5 star) and also the Four Seasons Hotel Park Lane (5 star) (both joint top with 99%). Base Rates: We show you the average starting rates (base rates) in the area and break it down by star rating. Trouble with this is that base rates do not include special offers and limited low rate deals. However they remain a useful guide to general rates. The average base rate when considering all hotels in the surrounding area is £283 per night. Starting from £49 at St George Hotel (3 Star, 59%) with top rates of £1000 at 45 Park Lane Hotel (5 Star, 98%). Rate averages listed by star level: Five Star average: £399, Four Star average: £155, Three Star average: £49 and Two Star average: £79. We rank hotels based on their guest rating but balanced for their influencing factors. We have ranked Millennium Hotel Mayfair 31st (joint) of 50 nearby hotels and 10th (joint) for the 21 four star hotels in the area. Our ranking for sheer lowest base rates is 22nd of 50 (18th of 21 four star hotels.). We calculate an overall ranking combining the rates and rating scores. This hotel ranks 32nd of 49 for pure value for money (The Arch Hotel was top). Below the London average but above the local average for 4 star hotels. Comment: The Avista restaurant is an AA 2 rosette holder. Pre-arrival shower facility for Millennium Club guests. This hotel has a wedding licence.